On December 4, 2014, we will be celebrating our 25th Foundation Day. In line with this, we are preparing some activities in coordination with the MSC Alumni Association. 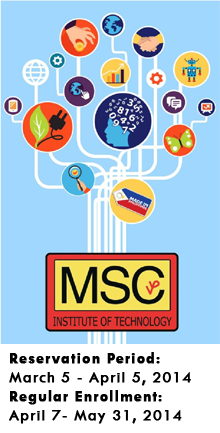 First is the Search for Outstanding MSC Alumni. We will be awarding 25 Tech-Voc, 25 High School and 25 Short Course (FCO, ACO, Caregiving and Call Center) graduates during our Foundation Day. The criteria will be announced in June. The MSC High School Advantage! Nagwagi si James Patrick Maghirang, mag-aaral ng MSC High School ng 3rd Place sa ICT-PC Assembly with Configuration and Networking sa nakaraang Regional Festival of Talents (Technolympics) na ginanap sa Nasugbu, Batangas noong Enero 14 - 18, 2013. Nagwagi si Rhyte Jeus C. Aldemo sa larangan ng paglalangoy (swimming) sa nakaraang Athletic Meet ng San Pablo City Division ng Dep. Ed. Si Aldemo ay isang third year na mag-aaral sa MSC High School. Set on 1.2 hectares of land in San Gabriel, San Pablo City, the MSC Green School Campus main building houses spacious classrooms, a computer laboratory, and a science laboratory.